There are objects that distributors do not like to move because of their weight or of their fragility. Or because of the two things together, as we will see shortly. 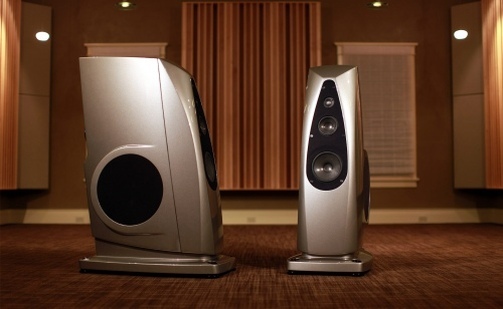 We are talking about a loudspeaker that weights 233 lbs and it's varnished in piano black. Moving it, it's a real nightmare because it's so easy to damage it. The Italian importer, that knows very well my passion for the Rockport brand, has decided to dedicate a whole afternoon to Audio-activity.com, in his listening room. Let's take a look backwards in time. Thanks to the many audio shows and to the used components that sometimes are present in many Hi-Fi shops, we had a quite precise idea of the sound of this brand. Unfortunately, Rockport was not distributed in Italy until Audioreference decided to bridge the gap. I had the chance to listen to many models during the years: the Merak, that I did not like too much even if they were at a very high level; the Antares, a real love at first sight, and the incredible, in every possible sense, Hyperion. Then ,here and there ,the Mira and the Atria. With the Altair, the second model from top range downwards, I had a very short meeting in Munich, too superficial for an evaluation. 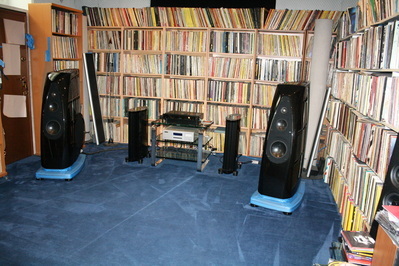 Since having them in my own "studio" was impossible, what else could I desire if not a listening session in the room of the Italian importer of this American brand? These are the technical characteristics of the system I listened to: the Altair are 4 ways loudspeakers with a 15" Audiotechnology custom woofer with a composite cone, an 8" custom midwoofer and a 5,25" custom midrange both Audiotechnology, and a beryllium dome 1" tweeter. The declared frequency response is 20-30.000 Hz at - 1 dB and the sensitivity is 91 dB. 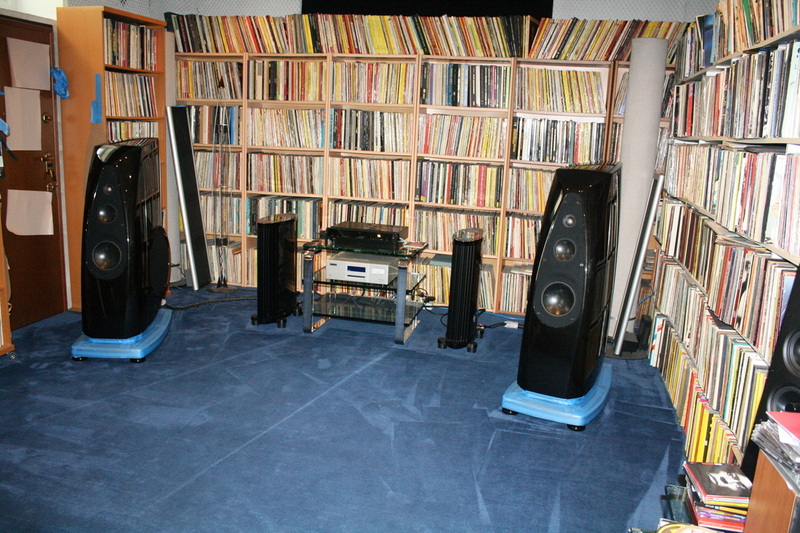 In this system, there was also a EMM Labs digital player, The Gryphon Mirage pre amplifier and two Gryphon Colosseum mono power amps. A quick look to the room: thousands of vinyl records to panel the walls, the best material to do it. It is Giuseppe Licciardello’s vinyl collection; he is the founder of Audioreference and he’s been supported in these last years by his son Federico. This collection is huge and I can't hide my envy, benevolent but still envy. In the Audioreference website you can find and interview to Giuseppe by Paolo Corciulo the Editor of the review Suono. It's very interesting but unfortunately there' s only the Italian version. Let's go back to the Altair that are the subjects of this article.This loudspeaker is impressive, for its dimensions (508x1320x899 mm) and also for its price: 99.000.00 euros. A price that implies a great care and the will to offer the best on the producer's side and a very careful choice on the buyer's side. With attention and no fears I grabbed the Altair by the horns and with the remote I started to listen to some of the songs I usually use to evaluate the systems when I am not in my own room. These are not only or necessarily audiophile records, but have some passages that are very demanding. The often used guitar and feeble voice that sound nice with no matter what system is strictly forbidden! Records with a deep low that must be reproduced with balance and precision, high dynamics to be performed with strength and precision, lyric voices, natural ambiance not electronically recreated, well recorded drums, not boosted by echoes that are spectacular but unreal. Well, no coup de theatre, Rockport is in my opinion among the best 5 (but maybe less) quality loudspeaker producers in the world. No colouring, no sound shaping, just music. What you get is not that cold sound, wearing and boring but real music that comes from these beautiful loudspeakers and cuddles your ears, getting very close to the perfect Hi-Fi system, without price and dimension limitations. I try and think of a possible competitor in this price range but I can't find anything equal to it. Mr Payor once again hit the bull's eye!